In the early days, most Android phones could only capture what was on-screen using extra tools or apps, most of which required root access first. The Samsung Galaxy S2 has a built-in screen capture utility, so taking screenshot is easy and doesn't need rooting or installation of third-party apps. 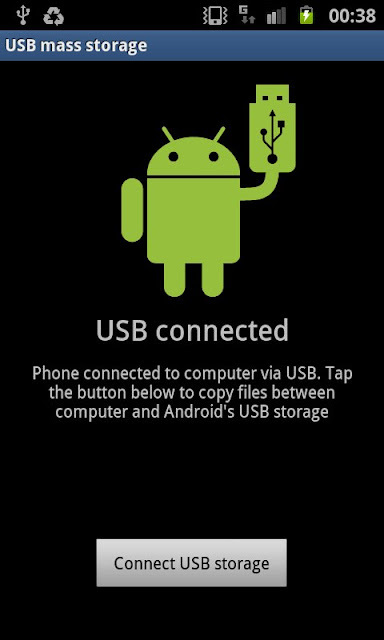 The Samsung Galaxy S2 screenshot app is invoked when you press and hold the HOME button then press the POWER button. You get the camera shutter sound and a flicker on the screen as the utility grabs what's displayed. It works flawlessly every time, with the image saved to the phone storage, in a screencapture folder. This is for Android 2.3. I was having problems connecting my Samsung Galaxy S2 over USB on Ubuntu, which is particularly annoying bearing in mind the total lack of native support by Samsung for Linux. Strange enough, it works flawlessly on Windows 7, where it recognises all the phone's storage it instantly and I can transfer files between my phone and computer. When I plug it into a Linux machine, the phone storage is recognised and I can see the folder structures of the phone and the SD card but I cannot even see, much less access the contents of any file or folder as all the folders appear empty. They are not. "It's time to share wirelessly! 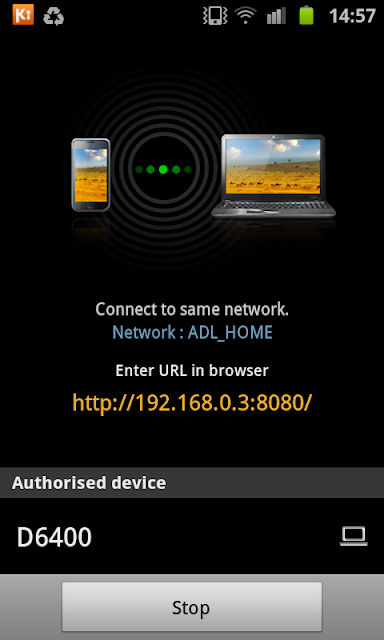 Manage your mobile via Internet browser. Kies air is a application that enables you to easily manage contents saved on your device via PC Internet or mobile browser using Wi-Fi technology. 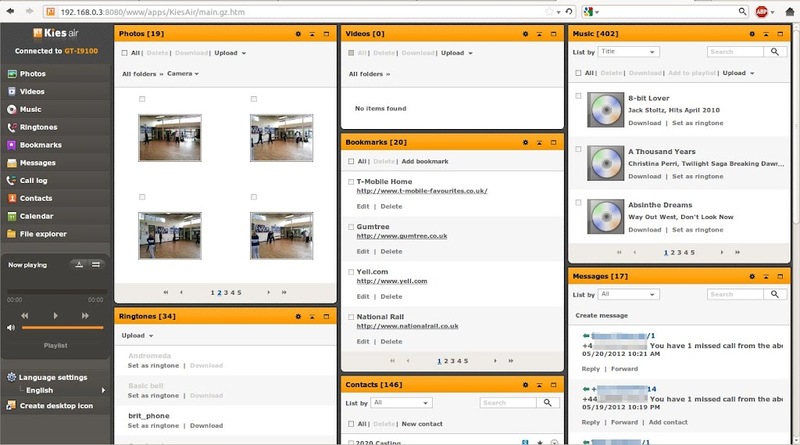 Without having to connect any cables, within a browser you can use diverse function such as multimedia transfer, music listening, PIMS management, text message, file search, and so on." I know I'm behind the curve on this wireless technology thing, but this is probably the coolest thing I've found on the phone so far. 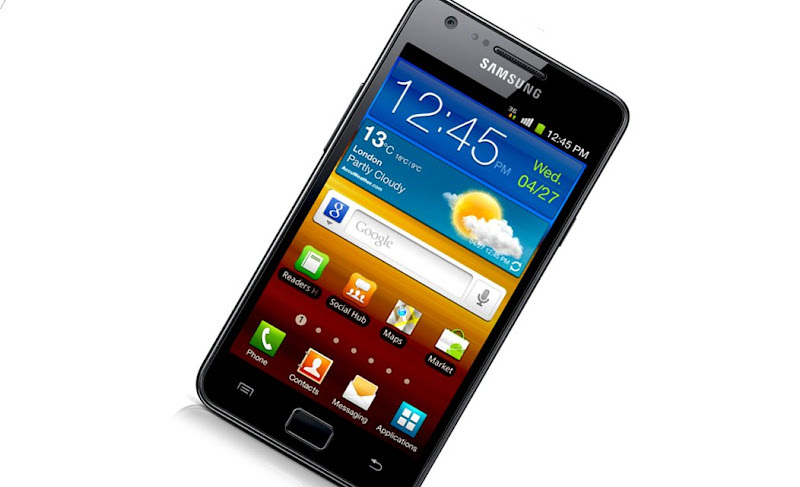 Kies Air is one of the bundled Samsung apps that comes on the Galaxy S2. I'm happy to report that it does exactly what it's designed for and it works great with no USB cable required to transfer data between the phone and the computer. The contract was up on the HTC Widlfire and the launch of the Samsung Galaxy S3 meant the prior model Galaxy S2 underwent a bit of a price drop - so I pounced. Despite it being exactly a year old model, I'm in shock and a little bit enamoured. The S2 packs in a lot of technology and it works so well, you forgive one or two rough edges. In black, it's a bit of a 2001 Space Odessey black slab; no design award winner. With power and volume buttons either side, there's only one physical Home key on the front, the remaining Menu and Back buttons are soft keys. The MHL port at the bottom is both USB charging socket and output to HDMI (if you get the right cable). The 3.5mm headphone jack is on the top. The super responsive 4.3 inch touch screen dominates, with a very narrow bezel (perhaps a little too narrow for comfort). The case is surprisingly thin and compares well against other current phones, albeit, the finish feels a little too plastic. However, hit the power button and WOW! The display is pin-sharp, with vibrant colour and excellent contrast. Native resolution of 800 by 480 means you can flip into landscape and get one of the best displays around, including one of the best soft keyboard layouts. Viewing angles are good, but the auto brightness feature gets unpredictable, so I mostly turn this off. 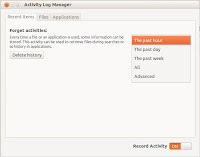 "Activity Log Manager is a graphical user interface which lets you easily control what gets logged by Zeitgeist. It supports setting up blacklists according to several criteria (such as application or file types), temporarily stopping all logging as well as deleting recent events." Spyware, browser session tracking, cookies, browser history; ever think you're Rockwell? "I always feel like, somebody's watching me... and I got no privacy. Oh-oh-oh." That includes your operating system. Ubuntu now has the Zeitgeist framework, logging activity in order to support search. Logging pretty much everything. That can be helpful, providing quick access to documents and anything else we may have opened.But that can also be a problem, since anyone who gains access to your computer can potentially see all that activity as well. 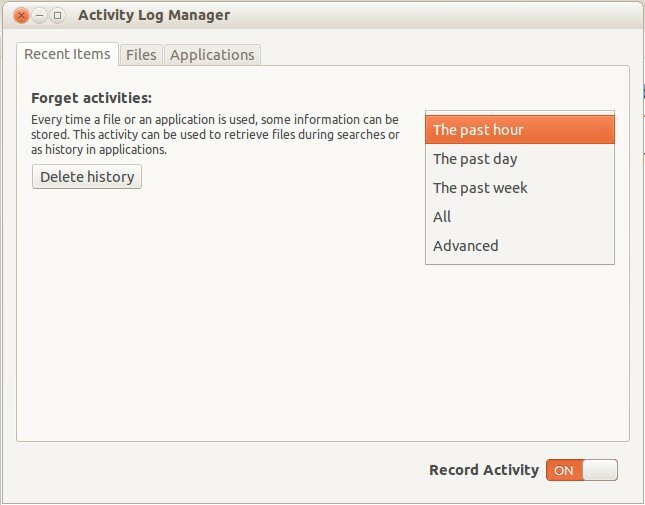 Except in Ubuntu 12.04, now the Zeitgeist Activity Log Manager puts you back in control. During the recent release of Ubutnu 12.04, trying to run in-place upgrades slowed down to a crawl for me. So many packages, so little bandwidth. Or so you might think. 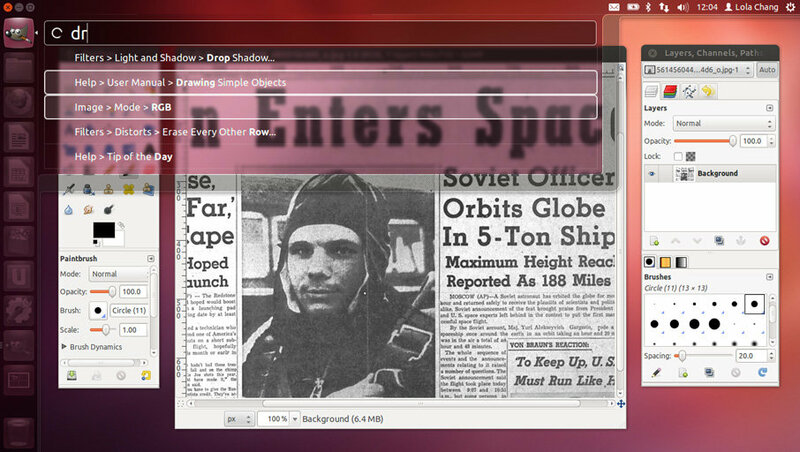 Except I recalled a feature that is in Synaptic that has been carried over to Ubuntu Software Center. Go to Edit -> Software Sources in the menu. You can also do this from the Preferences for Synaptic or the Update Manager. Under Ubuntu 11.04 and 11.10, my netbook has a problem; the Bluetooth adapter persists in turning itself on regardless of what you try to do to turn it off. I never use Bluetooth. It's slow, insecure and wastes battery. You can turn it off per session, but next time it's right back on. In System Settings, it shows as off. All the time. Clearly that control isn't effective. So let's delve a little deeper. First, always backup your configuration files! This is Part Two of our latest - and easiest - attempt to get the Freecom DVB-T USB receiver working under Ubuntu 12.04. Last time, we got through the process of installing the firmware, testing and configuring the channel list. Now we move on to setting up a media player so that we can watch some TV. There's a host of media players that can handle DVB-T. VLC, my favourite, needs to channels configuration file converted to an XML file it can understand; for that I need a Perl script and some hacking, so I'll leave that for later. Instead, I'm returning to another old favourite, Gxine. Announcing the new site for those who care less about what else we do on Everything Express but like the film reviews: Catling on Film. The 'brain-child' of Robin Catling, it's the film reviews distilled from Everything Express, plus some other comment and commentary on the film business. With guest posts from Pritchard, Corsten and maybe some others. 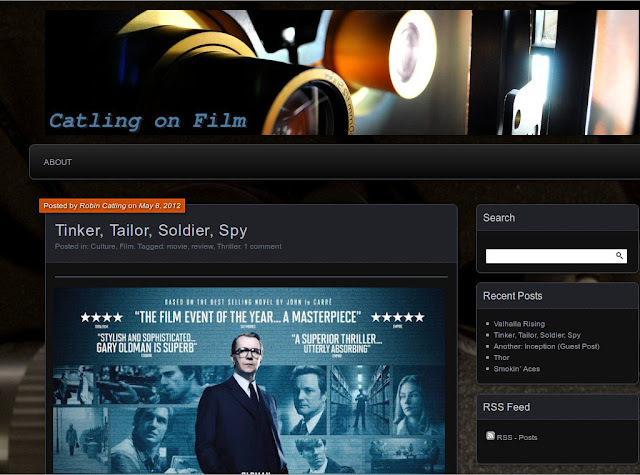 We realised there is such a strong movie bias coming through the Everything Express site, we might as well throw the spotlight on it and put it on a site of it's own. That's the whole idea, right there. 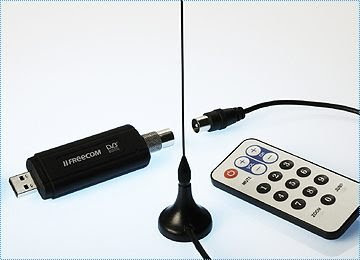 You may recall the on-off relationship with this handy piece of kit, something I hadn't used for a while; but I recently gave up on my cheapo DVB receiver in the study and pulled the Freecom DVB-T USB receiver out of a box to try to set it up on Ubuntu 12.04. Things got a lot easier since Ubuntu 11.10 included firmware for a wider range of devices. Now it comes up under Additional Drivers when the device it plugged in. No more messing with firmware! This is a huge relief since the firmware used to require several PhD's to install the right version. Glad to say, we got it working. Three physical and one virtual machine later, and the exacting armadillo is up and running with relatively few issues, only six bugs reported (five of which already existed) and some good new features for hardware compatibility and drivers in effect. Boot time - the whole process seems faster to me, which is an achievement given how much more is going on under the hood. Performance. I can add the whole release is running much more smoothly than 11.10 and certain operations run noticeably faster. 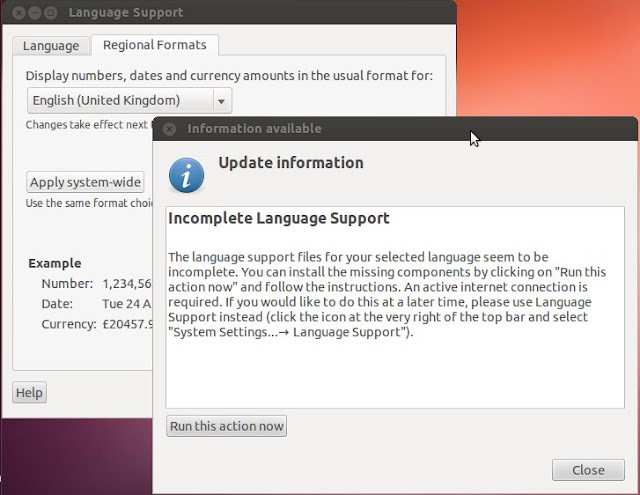 If you have upgraded to Ubuntu 12.04, you may be wondering what happened to the "Hibernate" option in the power menu. For those of you who are not aware or don’t use this feature at all, the Hibernate button usually lies above the Shut Down option and I use it a lot on my machines to save the current machine state to the hard drive rather than shut down or suspend. The next time you power up, hibernate restores to the previous saved state without going through the full boot process. 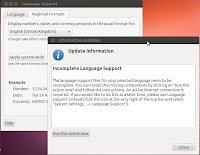 If you've installed Ubuntu 12.04, one of the first things the newly installed system does is query for full language support. Now, you will have chosen a default language for text and a keyboard layout during the install process; what pops up at first boot is a further dialog for setting language support with additional languages, setting the default, setting the currency and units of measure. The release of Ubuntu 12.04 includes new features and enhancements intended to make Canonical's heavily branded Linux distribution an attractive proposition for consumers and enterprises. 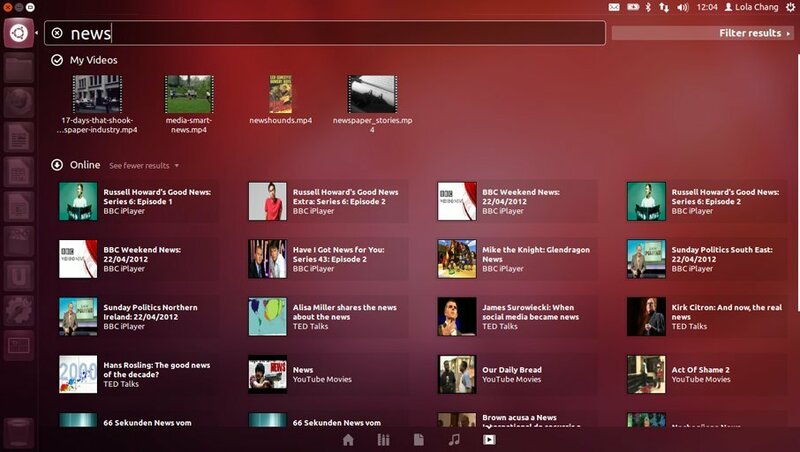 Take a look at what’s new and get the Ubuntu tour at http://www.ubuntu.com/ubuntu/whats-new. "The new HUD gives you a fast alternative to the traditional, menu-based way of telling your computer what to do. Instead of clicking on menu items to give it instructions, you just press one key to bring up the HUD and start typing what you want to do. You’ll then get a list of functions, without ever needing to know in which menu they live." Or so says Canonical. As an add-on to the Unity interface, the HUD extends the Unity-style search and launch capability pioneered with Unity's lenses. To us, it seems like another bolt-on search capability to make up for the fact that no one has a clue how to find anything in Ubuntu any more.